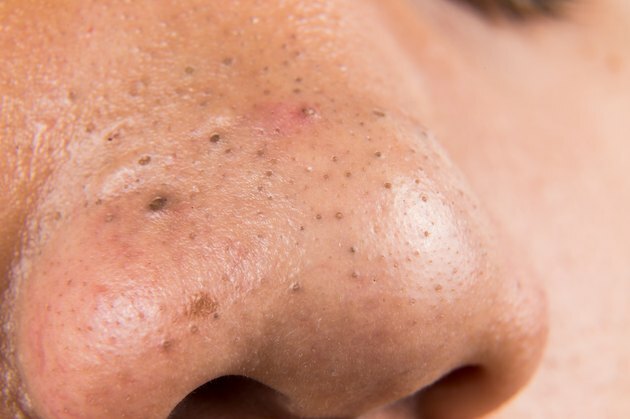 When little black dots speckle your nose, blackheads have likely taken over. Blackheads develop when oil gets trapped in the pores; when the oil is exposed to the air, it oxidizes and turns black. This can happen with any type of skin, but blackheads do occur more with oily skin. Although blackheads are typically small, they can be a big downer when it comes to your complexion. Blackheads can be removed by extraction, or you can use topical facial masks to remove them from your nose. Wash your face with cleanser to remove makeup, dirt, oil, and other grime. Use the hottest water you can tolerate when washing your face to effectively dislodge the grim, soften the oil, and open up the pores. Rub a thick coating of moisturizer over the nose. Moisturizer will help temporarily seal in the heat, aiding in the extraction. Smooth a small piece of plastic wrap over your nose without covering your nostrils. Soak two washcloths in hot water and wring them out well. Place the washcloths on top of the plastic wrap, one on top of the other. Leave the washcloths on your nose for five minutes. The heat from the washcloths will help to soften the oil and debris in your pores, making extraction easier. Put a tissue around the index finger on each hand. Place each wrapped finger at the very bottom part of the blackhead. Your fingers should be close to the blackhead, but not so much that they’re actually touching it. You want to extract the blackhead from the root, so starting at the bottom is essential. Squeeze the skin with your two index fingers until the blackhead pops. Move your fingers back and forth in a gentle rocking motion to dislodge the debris. If the blackhead doesn’t pop after a few attempts, wipe the area with an antiseptic wipe and leave it be until the next day and try again. Clean the area with an antiseptic wipe. Extracting a blackhead can cause trauma to the skin, so it’s important to properly disinfect the area to prevent scarring. Crack an egg and separate the yolk from the white, placing the white in a small bowl. Blend only the egg white with a fork until it becomes frothy. Smooth the egg white onto your nose. Leave it on for 20 minutes, then rinse with warm water. Put one egg white into a bowl. Add 1 tablespoon cornmeal and a splash of warm water. Stir well with a spoon, then massage the mixture onto your nose. Leave it on for five to 10 minutes before rinsing with a warm washcloth. Combine 1 tablespoon baking soda with 1 teaspoon warm water. Massage the baking soda paste onto your nose. Wait 20 minutes, then rinse with warm water. Always wash your face with facial cleanser prior to applying a mask or scrub to remove blackheads. For best results, steam your face before using a scrub or mask to effectively soften the lodged debris in the pores. If you suffer from blackheads, use facial cleansers that contain salicylic acid, which helps to clear up acne.